Here’s our now-officially-regular-again October gig preview post. And it’s only the 3rd October! It’s getting nearer to the start of the month every time we do one. Here’s this week’s new music roundup. I’m going to start this week’s post with a band described by a friend as “The best live performance I have seen in some time”. He was talking about Penelope Isles, who have a new single out called Shining Gold. The beautiful chiming lo fi folk number coincides with the band’s current tour, which started at the Prince Albert on 18th September (which is where the quote above came from). Since then they’ve been down to the South West and hit London tomorrow before heading north, but this bit of the tour comes back to Brighton next Saturday where they play a joint headline gig with Porridge Radio at Latest on Saturday 30th September. We wrote about loads of bands earlier this month in an arbitrary personal take on the year, but there’s been lots going on that we couldn’t include for one reason or the other. There were lots of bands who were just bubbling under, we didn’t write about any bands who were from Brighton – obviously – and we kept the list just to bands and didn’t mention venues or events or stuff like that. We tried to have a bit of balance across our advent calendar, making sure we had big and small bands, so it was always going to be the case that there was going to be some we couldn’t fit in. As well as The Maccabees and Bat for Lashes hitting hard for Brighton, Blood Red Shoes and Orbital were troubling the charts. While we’re talking about big acts, Fatboy Slim‘s most recent Big Beach Boutique was a success not on the beach but at the Amex, where they apparently ran out of beer on the first night. On the subject of local bands in sports venues, hundreds of people braved the rain in July when Rizzle Kicks accompanied the entrance of the Olympic Torch to Hove Cricket Groung Saint Etienne were further down our longlist than the album “Words and Music by Saint Etienne” and their gig at the Concorde warranted, but with only Pete Wiggs living in Brighton, we had to prioritise bands with more local members. Other bands with albums out in 2012 who we just couldn’t fit in were Tall Ships, Cave Painting, Ital Tek (referred to by one of my mates as possibly his album of the year), Sparrow and Negative Pegasus. When Todd Jordan isn’t being part of Negative Pegasus, he’s also one third of promoters One Inch Badge, who brought us the fantastic Sea Monsters festival at the Prince Albert as well as dozens of other great gigs, and is one of the people responsible for Bizarro World, a monthly covers gig which is so much better than it sounds on paper. There’s a few bands who’ve caught our eye that we’re expecting big things from in 2013. Crayola Lectern‘s album is recorded and due to arrive in Spring sometime on Bleeding Hearts Recordings. We saw Dead Cars live a few weeks ago and really really liked what they were doing, but it was too late to squeeze them into our list. But if we were to be pushed to name one act whose year it could be then we’d have to say Anneka. We’ve only seen her live once so far (supporting Com Truise at The Haunt), but there was something about what she was doing that sounded so fully formed, that she’s bound to be huge. Woodpecker Wooliams has played a great second half in the game of her year. Back in May we saw her play a beautiful short set in the tiny Fishbowl Pub to an audience of about a dozen blokes who probably hadn’t heard of her. However, her album ‘The Bird School of Being Human‘ was released in September and since then she has garnered an array of great reviews, including a great band-of-the-day piece in The Guardian, and much airplay for the album and its lead single ‘Sparrow’. It really is one of the most original and enchanting albums of the year. The video for the single, by Gemma’s sister, involved puppets and a lovely cranky sound helped on by producer Marcus Hamblett of The Sons of Noel and Adrian. Watch it below. New single Gull is out now and another slam-dunk classic. For the second single from their album However Did The Wolf Get in, Sparrow have teamed up with Your Explosion My Mind for a split 7″. 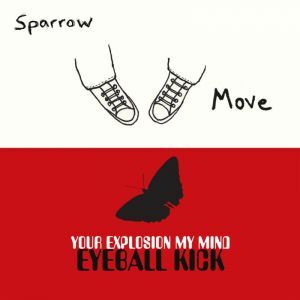 Sparrow’s Move shares vinyl with Your Explosion My Mind’s Eyeball Kick. Charming video by her sister for this song ‘Sparrow’ from the new Woodpecker Wooliams album due to drop in September. It’s called ‘The Bird School Of Being Human’. Can’t wait! Living in Brighton is fantastic, because there’s always something happening. Sometimes though, it can feel that there’s not enough hours in the day to do everything you want to, and thursday is one of those nights. There’s three gigs on, at the Pavillion Theatre, at the Green Door Store and at Coalition that I’d like to be at. The one I’ll be going to will be the one I bought a ticket to before finding out about the others! First of the three is the Source New Music Night at Pavilion Theatre. 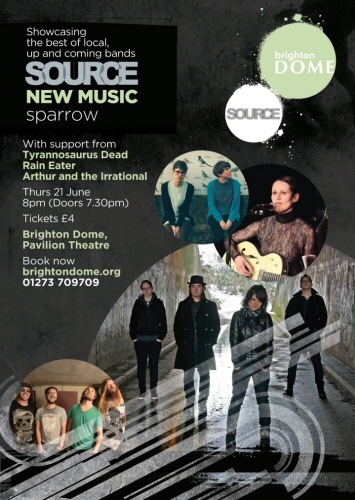 Sparrow are headlining, and they’re supported by Rain Eater, Arthur and the Irrational and Tyrannosaurus Dead. I normally do my best to get along to the Source Nights, because they’re great for new bands and an absolute bargain at only four pounds. Next month’s – headlined by Sweet Sweet Lies – is already in the calendar. Then we’ve got The New Union at Green Door Store, who really impressed us supporting Clock Opera a few weeks ago. And that’s even more of a bargain, because it’s free! We’re big fans of the Peter Saville style posters – there are four different varieties each relating to a different band member. The gig I’ll be at though, will be Best Coast and Fear of Men at Coalition. Here’s the video for their new single Green Sea. Expect a few words and maybe some pictures on the gig later this week. Hopefully you’ll make it along to one of these, or one of the many other gigs going on all round town. You’re spoiled for choice!